Although the question of national minorities in Lithuania is raised frequently, steps are still not taken towards the legal regulation of the current issues concerning minorities. The lack of the Law on National Minorities causes confusion in the political arena and poses a number of legal problems. During her visit in Warsaw on the occasion of the 25th anniversary of the first free elections in Poland, President Dalia Grybauskaitė said in an interview for the Polish Press Agency that nothing has changed in recent years in the situation of the Polish minority in her country. In view of the above statement, European Foundation of Human Rights (EFHR) recalls that since 2010 the number of infringements of the rights of national minorities in Lithuania is constantly increasing. Unfortunately, this is not the first time that the President has publicly presented untrue information, of which we have already written. It should be noted that in 2000 Lithuania ratified the Council of Europe’s Framework Convention for the Protection of National Minorities without objections, therefore it should comply with its provisions. The EFHR also recalls that the Law on National Minorities in Lithuania which lapsed in 2010 was the only document since the beginning of Lithuanian independence to regulate the status of these most vulnerable groups and to provide legal protection of minorities. The lapse of the law caused a number of legal problems, such as, for example, the imposition of huge fines for bilingual signs in areas densely populated by national minorities, which were placed there at the time when the old Law on National Minorities was in force. At present, bilingual street naming is illegal in the Republic of Lithuania. Nevertheless, a closer analysis reveals loopholes in the existing legislation, as evidenced by the example of street names in English which are legal according to the law of the Republic of Lithuania. Problems arise also in the field of education. According to EFHR, Lithuania does not comply with international standards, which is best exemplified by the Education Act being clearly in breach of the European Council Directive 2000/43/EC implementing the principle of equal treatment between persons irrespective of racial or ethnic origin. A worrying phenomenon is the unification of the state language exam (identical exam is taken both by the Lithuanians and representatives of national minorities) which was implemented without setting an adequate transition period to master the new curriculum. Such a change in the education system is discriminatory and indeed gives children attending national minority schools unfavourable starting position. In its resolution on Lithuania the Committee of Ministers of the Council of Europe noted shortfalls in the implementation of the document’s provisions (resolution No CM/ResCMN(2012)19). The Lithuanian government still does not fully comply with the standards for the protection of national minorities set out in the Convention, which makes the improvement of the situation of national minorities one of the pressing duties of the country’s internal policy. 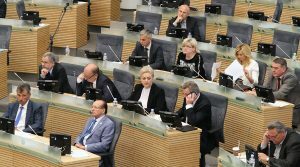 Some politicians propose restoring the old Law on National Minorities, but President Dalia Grybauskaitė rejects such possibility, recognising the incompatibility of that law with the Constitution of Lithuania. The current draft prepared by the working group headed by the Deputy Minister for Culture authorises bilingual public signs in localities where representatives of minorities comprise at least 25 percent of the population. A negative opinion on the draft was expressed not only by the President but also by the State Commission of the Lithuanian Language. The political council of the ruling coalition agreed to adopt the draft Law on National Minorities by the end of the spring session. It is worth mentioning that the working group dealing with the draft has not held any meeting so far. The EFHR counts on the Lithuanian authorities to take actions to comply with European law and to ensure adequate legal protection of all the country’s citizens, including national minorities, which would considerably improve the image of Lithuania in the international arena. Tłumaczenie by Marta Żelazow	w ramach praktyk w Europejskiej Fundacji Praw Człowieka, www.efhr.eu. Translated by Marta Żelazow	within the framework of a traineeship programme of the European Foundation of Human Rights, www.efhr.eu.